Yeah the only reason I bought the game was a) to support the devs and b) to queue up more than 4 orders. I wouldn't want multiple games either. edit: back on the general topic of things to buy on Google Play.... Board Game Sale on Google Play. I'm at day 8 in my first game... I'm in a pretty good spot at the moment. I feel I've made good choices with my specialists (general + war hero + diplomat combo is killing it) and have managed to deflect attention to an 'ally' by allowing them to take a 2nd mine (in exchange for one of their specialists). So now hopefully this will result in 'our' enemies focusing on him while I keep beefing up & work out how to swoop in when they're all weakened from smashing each other. Loving the tactical nature but the constant urge to check what's happening is crazy. Baby woke me at 3am this morning, I was almost glad as it let me check out what'd happened & schedule a move or two. Almost at Day 12... everything has gone according to plan.. enemies started focusing on my other 'ally' allowing me to swoop in and grab two mines, build one of my own, and have considerable defences at all of them. There was one hairy moment when I had to use a smuggler to pull drillers to defend a mine... normally a 60hr trip from where he was, but thanks to his 3x speed boost got there with about half an hour to spare (in this game, that's ridiculously close) and then had to do a few tricks to deflect / destroy a multi pronged attack at a mine from pretty much everyone else who has now realised my endgame strategy... I still need to hold them off for 24 hours to seal the win but I can't see myself losing from here. Shakey - absolutely loved the game, but holy crap if I play again I will have to force myself not to be so obsessive in checking it. 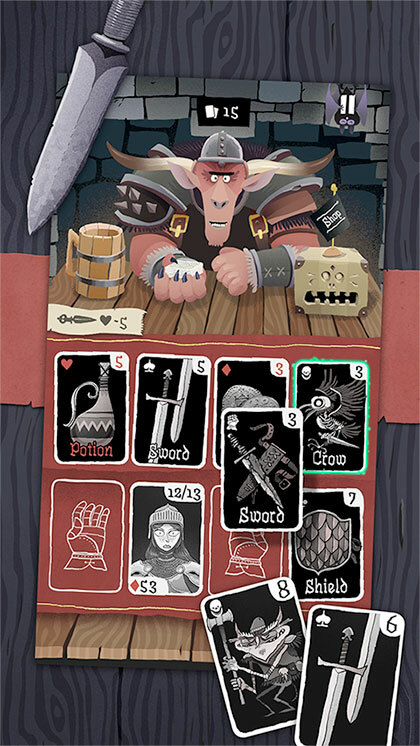 Another good game is Card Crawl. Like Subterfuge it's free to download, you get a demo version that you can unlock the full game for £3 (So I guess about $6). Which is a good way of doing it imo -- games never have demos any more! and you don't get bogged down in microtransactions. But other than that its completely different to Subterfuge. It basically distills a rogue-like dungeon crawler into a solitaire-style card game you can play in 5 minutes on the train. Doesn't sound like much but it's really good game design, it won mobile game of the year from a lot of gaming sites. It's also a good example of something that's been interesting me lately, games that are mechanically pretty much board/card/table games, but which have too much computational score-keeping and so on to be feasible as an actual board game. You get the best of both worlds, keeping the really succinct game design of the board game world, but using the power of a computer to do all the 'heavy lifting' in terms of stat tracking and score keeping, opening up possibilities that wouldn't be feasible in an actual board game . I guess Subterfuge could be seen as a kind of "board game" as well, but not in a way that you would ever be able to play on an actual board. I'm less and less interested in interactive movies or alternate realities and more and more interested in actual game design. I'm just finishing off my 10th game and my record will be 7 x 1st place, 2 x 3rd place and once eliminated (got targeted early by multiple people, and there's very rarely a comeback from that). Considering most of those games were 8 players I'm doing pretty damn well! Don't think I've seen a player with a better win ratio yet. Don't know if you're still looking for games to use that 100 on or if subterfuge somehow ate all of it, but I recently decided I'd buy XCom Enemy Within on Android, despite only having a 4.6-inch screen phone. Actually, it plays pretty marvelously on that and you absolutely don't need a big screen for it. Panning around the battlefield is not difficult at all, and the only wonky camera issues are zooming in and out by tapping keys. It's nice to play pretty much a full pc game on the phone and though things get toasty and it guzzles battery life, for a 30 minute commute or something it's cool. I expect it'll play a bit nicer on a bigger screen. Cool, good to see you still enjoying it. I honestly had to give it up because it was sucking up so much time & mental focus. Each game of subterfuge is a massive mental strain... I take a month off between games most of the time. Hence why I've only played 10 games since installing in November last year.